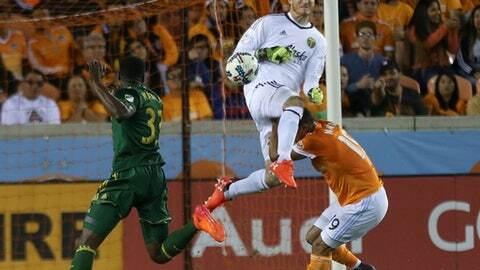 HOUSTON (AP) Jeff Attinella had two saves to help the Portland Timbers to a 0-0 draw with the Houston Dynamo on Monday night in the opener of their Western Conference semifinal. The top-seeded Timbers were already without Fanendo Adi, Sebastian Blanco and David Guzman. Adi was second on the team with 10 goals despite missing the final 10 regular-season games after he injured a hamstring during a 3-1 win over Los Angeles on Aug. 6.